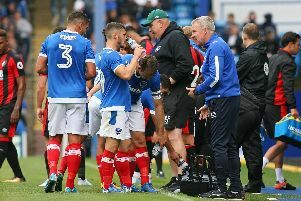 Pompey were glad to avoid being landed with an FA Cup second-round replay – but a couple of their close rivals at the top of League One were not so fortunate. Sunderland have an added game they could probably do without after they were held to a 1-1 draw by fellow League One side Walsall at the Bescot Stadium. Struggling Bradford struck back from the dead to claim a 2-2 draw in their all League One tussle at Peterborough, who are another of the sides chasing Pompey in the League One promotion race. But Kelvin Mellor blazed home from long range in the 84th minute and two minutes from time Luca Colville's deflected effort earned a replay. There were differing fortunes for other third-tier outfits in the weekend’s ties. Cauley Woodrow hit a second-half double as Barnsley won 4-2 at Southend. Kieffer Moore and Mike-Steven Bahre also scored for the Tykes while the Shrimpers' efforts came from Sam Mantom and Timothee Dieng. Goals from James Henry and Cameron Brannagan paved the way for Oxford's 2-1 win at Plymouth, who replied late through Antoni Sarcevic. FC Halifax Town missed early chances as they lost 3-1 to AFC Wimbledon. Wimbledon withstood the early pressure and snatched the lead through Ben Purrington's deflected effort just before the break. Two goals in three minutes midway through the second half from Anthony Wordsworth and Joe Pigott sealed Wimbledon's win, before a late James Hanson own goal gave Halifax some consolation. Yesterday’s action included Slough's campaign being ended by Gillingham, with Darren Oldaker scoring from outside the box in the 48th minute at Arbour Park to give the struggling League One club a 1-0 win and some reason to be cheerful. Harry Cornick’s 40th-minute goal earned Luton a 1-0 win at Bury. Solihull confirmed their place in Monday's third-round draw with a goalless draw with Blackpool on Friday night. Maidstone battled well after conceding a 13th-minute opener to Oldham's Peter Clarke at the Gallagher Stadium. But Chris O'Grady fired his side's second from an acute angle eight minutes from time to seal victory for the league side. League Two Lincoln are enjoying another cup run after seeing off Carlisle 2-0, Matt Rhead opening the scoring in the first minute and John Akinde adding a late second. Wrexham and Newport must also replay. Jake Hyde booked non-league Woking a place in the third-round draw by scoring the only goal of a 1-0 victory at Swindon. The Robins have recorded back-to-back Sky Bet League Two wins under new boss Richie Wellens but Woking striker Hyde headed home from Josh Casey's cross after 56 minutes at the County Ground. The draw is live on BBC1 from 7.30pm on Monday and Pompey are ball number 60.